At the First Korean Presbyterian Church and Community Trust Centre - 22 Edmonton Road, Henderson Auckland 0612. Our team is dedicated to providing a fun-filled positive programme where children are engaged and excited. We theme each term and design awesome activities to create unique experiences for the children. 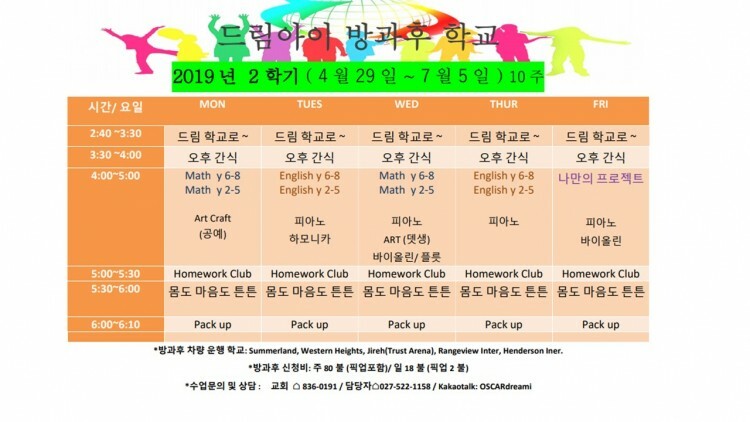 Each day includes, Afternoon tea time, homework club and a fun activity followed by free time. Our activities cover a huge range from sport/games to cooking, arts, languages, crafts, dance and even on the odd occasion a movie. All the while being under the care of experienced supervisors. We must be notified no later than 1pm on any day your child is not attending. Casual booking must be booked the day before attending. We also have a late fee for any child not picked up by 6.10pm. The children are picked up by the FKPCCT staff from their school if not within walking distance. The centre will provide afternoon tea. $80 per week (note we do not refund for absences). Invoices will be forwarded at the beginning and the middle of each term (cover a 5 week). BNZ Bank 02-0272-0303099-000 Please note your name in the reference and your child’s name in the code. Please ensure that your claim is made at least 2 weeks prior to the start of the programme. If you have any problems or queries, please ring the office on 09 836 0191.